Your major, class rank, class year, fan, etc. We reserve the right to refuse to post O-H-I-O images for any reason at any time. The Ohio State University reserves the right to reproduce all images uploaded to the O-H-I-O site. It started out as a simple football cheer. It was something for late 19th Century fans to shout during football games. But today, "O-H-I-O" means the whole package: strong athletic traditions, major school spirit, academic achievements and community outreach. 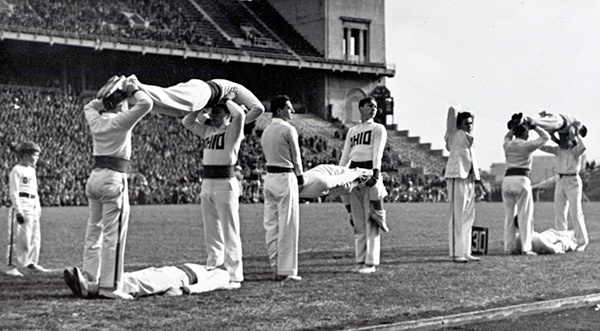 This 1936 photo of cheerleaders in Ohio Stadium is the first O-H-I-O photo ever taken. They spelled out O-H-I-O with a few more people - and a lot more athleticism.